Ayat 9-26 tell us a mysterious story of some youths who retreat to a cave. The opening question in ayah 9 is oddly posed. Quite a few stories in the past have been introduced with a similar question, asking the audience to consider some past historical or natural event as a sign from God. This ayah is not quite the same. It does not ask people to consider whether the event was a sign from God, but seems to take that assumption for granted. After I sat with it a while and parsed through the Arabic, I’ve decided it is instead asking people to evaluate whether the story is anything special as compared to the other signs that God has provided. So let’s look at the story. Some youths (no less than three by the type of plural) flee to a cave and pray to God for mercy and guidance to deal with their circumstances. The word awaa, “retreated,” comes from roots connoting “shelter,” so this retreat is an escape to refuge, not the more neutral English option of “went away.” I want to note this because I think the story assumes its audience already is familiar with the account and thus explains no background. We don’t know why the youths have hidden or who they are hiding from. God answers their prayer by making them sleep for a number of years. Sleep is perhaps not quite the right word, for they are described as looking wakeful and moving around. If this sounds creepy, the Quran intends it to and tells that you would have freaked out and run away if you had seen them. The youths also have a dog who stands guard over the cave. It isn’t clear whether the dog is in this wakeful sleep or not, but the story is certain that there is a dog. In the ayah 12, it says that God awakens the youth in order to show which of the two factions best estimated the amount of time they had been there. If that last sentence of mine sounds awkward, it’s because the ayah I’m referencing is equally awkward. Who are the two factions? Was there a bet going on? What is the point of this estimation? What is at stake? It’s hard to connect this verse to the story, as the story next proceeds to regress to some time before the slumber where we get a sermon of the youths’ faith and their decision to hide in the cave. We still don’t know why the youths retreated, except out of disdain for their homeland’s culture. It isn’t until ayah 19 that we see the youths awaken and learn they can’t agree for how long they’ve been asleep. Some estimate half a day, but some just shrug with a “God knows.” Thus it could be that the two factions in ayah 12 are within the group of youths, with some calculating their slumber was short and others feeling less certain. How does God reveal whose guess was better? Well, they did not bring with themselves any food, so they send someone to sneak into the city and buy some with a silver coin. This is the point where we learn they are hiding from deadly persecution at the hands of the polytheists. The youths are discovered, however, and it’s not clear if they are discovered when the one goes into the city or if they are found while still in the cave. Either way, their discovery becomes a sign to the people, and a mosque is built on the site of the cave. I find the mosque bit interesting because building a site of worship in such a commemorative fashion constitutes a shrine. There is no moral commentary given over whether the shrine was a good or bad thing. Muslims (particularly Shiite) of the past took to building lots of shrines and commemorative mosques (including the Dome of the Rock) and Islamic extremists of today (most notably the ones with Wahhabi roots, which was the group that tried destroying even Muhammad’s own tomb) have taken to blowing those same shrines up. Here I want to point out that this story has used “they/them” almost entirely without subject nouns, and it gets really hard to follow by ayah 21 when there are multiple groups of people in action. Who is in debate, who is building the mosque, who is talking at any point in time is all indistinct. As we see going on, the story itself is also quite fuzzy to Muhammad and his people. The Quran eschews committing to how many youths were involved (though remains firm about the dog), and the audience is told that no one really remembers anymore, so just take heed of the story, don’t fret the details, and don’t debate over such things. Only one detail gets divine endorsement: that the youths were asleep for three-hundred and nine years. We presume those are lunar years, which would be 300 solar years. This story has a little bit of a ghost story tone to it, but it’s not an outrageous miracle to swallow. It’s miraculous, but not outlandish or arbitrary in detail, certainly not compared with the big fish of Jonah. The sequence in which the story is told is a little confusing, and certainly the muddled pronouns make the conclusion dizzying, but I think there’s enough detail to communicate all that is essential to the point. Some faithful youths take refuge in a cave from persecution, God puts them to sleep for 300 years, they wake up and society is divided on how to respond to the miracle. I decided to look up traditional accounts and see what things they expanded or fleshed out, and was surprised to find this wasn’t an original story, but a carryover from Christian traditions. Many of the Islamic commentaries rely heavily on the Christian traditions. A good expanded summary of the Companions of the Cave story from a Muslim traditional standpoint can be read here. This commentary elaborated more on the traditional setting of how and why God revealed Muhammad’s Surah al-Kahf to Muhammad. It says that the Meccan pagans appealed to the Medinian Jews for topics and questions with which to refute Muhammad’s claim to miraculous knowledge. God provides this surah in answer. I find that story questionable, as it doesn’t make sense that the Jews would equip the Meccans with a story from pro-Christian propaganda, neither do any of these other stories relate to Jewish religion or tradition. Ayat 32-46 constitute less of a concrete story and more of a parable. Two men each have a prosperous garden. One of the men grows arrogant, taking pride in his prosperity and bragging that he has more than the other. His conceit grows so great that he starts thinking that he will live forever, or that if even he does die God will only reward him further. The second man rebukes the first, reminding him of human insignificance and helplessness before God, and says that no man should say anything without invoking ma sha’allah, “what God wills,” and granting that God has all power. The second, righteous man warns that God has the power to reverse the status quo and destroy everything the first man has while rewarding the second man even further. God fulfills the righteous man’s warning then by doing as much, and the story transitions into a sermon about earthly life as temporary pleasure that blooms and fades as God wills. Also, the first man is a polytheist. Sort of. The second man claims moral righteousness by announcing his own rejection of shirk, which we presume is supposed to contrast with the arrogant man. When God punishes the arrogant man, the latter expresses remorse by crying ya-alaytanii lam ishrik bi-rabii aHad, “I wish I hadn’t associated with my Lord anyone.” Associating anyone/anything with God is how the Quran defines polytheism, but note that the man’s crime as set up in the parable’s beginning was arrogance, not worshiping other deities. The message here could be that extreme arrogance constitutes a sort of worship of oneself and one’s possessions, thus becoming a form of shirk. The parable doesn’t denounce possessions, it just ridicules the kinds of assurance people derive from prosperity and how it takes the ego to spiritually unhealthy places. Considering that shirk is the most severe sin listed in the Quran, this lesson has more consequence than is at first apparent. So I said that none of these stories relate to Biblical ones, yet ayat 60-82 feature Moses as their main character. While the main character is Moses, there is no other connection to the Biblical account in sight. That the story features only Moses, but no Aaron, could mean this is supposed to take place between when Moses fled from murder charges in Egypt and when he returned to deliver the Israelites. Moses also demonstrates a sort of flawed, childish character that seems unfitting to a full-fledged Muslim prophet. On the other hand, Moses has a servant in this story, suggesting a more prosperous time (though I grant that this could be a servant acquired when Moses resided with the Midianites). God says that Al-‘Abd has received mercy and knowledge, so Moses asks Al’Abd for a sort of apprenticeship. Al-‘Abd at first refuses, saying that Moses doesn’t have enough patience to handle the things Al-‘Abd will show him. Al-‘Abd isn’t mean in saying this, for he explains that it is only natural for someone to be impatient over things they cannot understand. He eventually gives in to Moses’ pleading on the condition that Moses promises not to speak unless spoken to. Moses and Al-‘Abd set out. The servant gets left behind or forgotten at this point, as all pronouns going forward are in dual number. Al-‘Abd and Moses embark on a ship, whereupon Al-‘Abd puts a hole into the ship. Moses is indignant that Al-‘Abd should endanger the lives of the sailors and rebukes him, whereupon Al-‘Abd essentially tells Moses “strike one.” Moses begs forgiveness and they continue on. Al-‘Abd comes across a boy and promptly murders him. Moses again bursts into outrage at the gross moral overstep, but Al-‘Abd essentially answers “strike two.” Moses again begs forgiveness and says that if he breaks his promise again Al-‘Abd is fully justified in sending him away. They continue on. At this point Al-‘Abd deigns to explain himself. He broke the ship to protect the sailors from having their property seized by a greedy tyrant at large. He killed the boy because the boy was only going to bring grief to his godly parents, and God wanted to clear the house for another, better son. Al-‘Abd repaired the wall because it was hiding treasure left by a godly man for his two sons. The sons were too young to claim and control their inheritance should it be discovered now, so he repaired the wall that it might collapse and expose the inheritance at a later time when the sons were old enough to seize it. And thus the moral of the story is that for the greater good you might get called upon to do some questionable things. Merely doing good doesn’t mean your choices will lead to good, and so goodness without knowledge is counterproductive. Those without knowledge will not understand why these counter-intuitive events must happen, because they can only see the here and now and can only predict good and evil in the most limited of perspectives. Those without knowledge are required to be patient, not allowed to question injustice until the day that God deigns to reveal all. With God, everything happens for a reason. But let’s back up to that child. It’s strange to me that this story concludes with the dilapidated wall, when to me the clear climax of Moses’ confusion should have been the act of cold-blooded child murder. The way that Al-‘Abd frames all his acts, but particularly this one, shows that he has superseded moral codes and is now operating on ethical principles instead. Killing the child for him is on a similar level of decision-making as the trolley problem (particularly look at the Fat Villain variant). As long as one has the knowledge to evaluate the consequence of the lives at stake, one has the authority to decide who lives and who dies. Note that Al-‘Abd prioritizes the emotional life of the two believing parents over the entire unlived life of the boy who he dreads will bring the parents’ suffering. The troubling exemplar of Al-‘Abd is that he rather justifies the idea that, with knowledge, one can reach a higher level of morality that trumps personal morality. Killing the innocent is justified as long as you know they are going to be guilty eventually. The quality of life of the righteous trumps the existence of the unrighteous, and those with the ability to distinguish between the two are allowed to act upon it. Now, Al-‘Abd is supposed to have received divine knowledge of a sort greater than Moses’s, so I’m not saying Islam portrays him as an achievable exemplar. In the end, no one in Islam should be able to wield this kind of executive decision because no one has as much divine knowledge as Al-‘Abd. But still, all society buys into this kind of idea more or less on different levels, to troubling results at times. I also want to make a big deal of some pronouns in Al-‘Abd’s explanations. When Al-‘Abd explains the ship incident, he uses “I,” when explaining the murder he uses “We,” and when explaining the wall he attributes all intention to God. Consider thisflexibility of pronouns for a moment. Why would Al-‘Abd start speaking of himself in the plural, using a manner of speaking that copies God’s own manner? This ambiguity is on par with the Biblical ones of the Jacob’s fight with the stranger and Gideon’s encounter with the angel (note Judges 6:17). In those stories, some inconsistencies in the text make it unclear whether the stranger/angel is an operative of God’s or in fact God Himself. Al-‘Abd in some ways acts like God in human form. Now, if God would not reveal Himself to Moses on the mountain in al-A’raaf we can’t imagine He’d take on human form and travel with Moses here. But there is a blurriness. It seems that Al-‘Abd’s will is so in-sync with God’s that he can claim that his actions and emotions are also God’s actions and emotions. Thus his “me” became “we.” This idea resonates with concept in Islamic mysticism, whereupon one can have enough knowledge and connection with God that one’s sense of self starts blurring with Him. I’m sorry that I called the servant Al-‘Abd, when it would probably be better for you if I’d called him by his traditional name Al-Khidr. When I found that he is a named character in Islamic tradition, I thought about going back and changing my post accordingly, but the character of Al-Khidr is so radically elaborated from the Quran’s version I decided to avoid it for fear it would corrupt how we perceived the material in its given form. Take a look at this site to get a whiff of how much Al-Khidr means to the mystical community of Islam. I also want to mention here the existence of Sufi Muslims, a mystic subgroup of Islam that has at some points been persecuted by the dominant orthodoxy for not adhering to sharia law as closely as desired, and for occasionally featuring important teachers professing experiences of unity with God. 83-98 answer a question regarding dhi-l-qarnayn, usually written as Dhul Qarnayn. 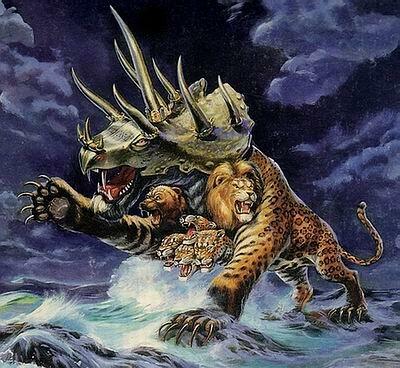 The name seems to mean “the two-horned one,” bringing to mind Judeo-Christian apocalyptic literature which regularly describes creatures with too many eyes and horns than is good for visual portrayal. But oh! Artists do try. In apocalyptic literature, horns usually symbolize an era of power. Or so I’ve heard, this is actually a subject that I’ve not delved into. I am in no way able to comment whether this meaning is legitimate and whether it applies to the Quran’s language here. Dhul Qarnayn is a ruler who has been given dominance by God (84). He goes forth on expeditions (“follows a way”), and by divine commission kills or reforms the communities he encounters (86-88). He conquers out to the west (where the sun is setting) and then also conquers out to the east (where the sun is rising). There in the east he finds a people who cannot be conquered (I take the second “it” in 90 to mean the community, not the sun). He takes another expedition and comes to some mountains around which are settled people who cannot understand his language well. These people are under distress from some other forces of chaos, Gog and Magog (more language borrowed from apocalyptic literature), and they ask Dhul Qarnayn to build a wall for them. Dhul Qarnayn rejects payment in favor of God’s reward, and then rallies the people to build a copper-plated wall of iron between the gap in the mountain range. (While metallic fortifications of that kind are not evident, historians think this is is a reference to the Alexander Gate.) Gog and Magog cannot progress beyond the wall, but Dhul Qarnayn warns that this relief is only a temporary mercy. There will come a day when God will level the wall and let chaos reign. Whether this is before or upon the Day of Judgement is not clear to me. Now, my summary above is fairly interpretive, helped along by my reading through some commentaries. Much of the language in the story is indirect or figurative. I think it’s pretty obvious that this story is trying to homage the apocalyptic literature of the Bible. Historically speaking, we aren’t sure who Dhul Qarnayn is supposed to represent. This commentary makes a case that he is Cyrus the Great, connecting “the two-horned one” to a symbol of the Medio-Persians in the apocalyptic sections in the Book of Daniel. A really common tradition is that he is Alexander the Great, and this view dominates the Wikipedia page. By late antiquity, Alexander the Great had rather ascended into myth status in East Roman culture, like a sort of Greek George Washington. Robert Hoyland’s book Seeing Islam as Others Saw It surveys lots of late antique Christian manuscripts about the end times in which Alexander the Great reappears as a sort of military Messiah recapturing the land for God. So while the Quran’s Dhul Qarnayn doesn’t resemble the historical Alexander, it is possible that he resembles Alexandrian myth of that time. I don’t have the ability to confirm that. Regardless of who he is, Dhul Qarnayn’s story is perhaps the most bizarre in detail of the ones we’ve yet read, with much in question as to what is literal or not. Within this story there is the image of the sun setting in a spring of mud. What do we make of that? Most translations add some kind of “seemed to be” clause to discourage literal interpretation, and I’m fine with that. I think there’s plenty of room to argue that this story is using figurative language, with the name Dhul Qarnayn making a good indicator of such right from the beginning. Well this surah was fascinating to me. These stories are all new, and they all provide something new to my image of Islam as well. In The Companions of the Cave, I found precedence for the construction of shrines (although no comment was made whether this was a good or erroneous act). In the Parable of the Two Gardens I found that intense arrogance approximates some kind of shirk. In The Discipleship of Moses, I found some roots for mystic tradition. And in the Feats of Dhul Qarnayn I found something approaching the figurative style of apocalyptic literature. Those are the things that surprised me, but within the story there are also many moral messages available for Muslims. How complete were these stories? Well, I’d say Dhul Qarnayn was pretty hard to make sense of from its own text. It helped a lot for me to read some commentaries that explained him as some successful military ruler. The Companions of the Cave had all the details that I needed, but they were mushed together in lack of sequence that made the first read rather baffling. It felt much more like a story being told to people who already knew it, so that the sequence of details and plot was not important. The Two Gardens parable was fine, and although the depiction of the first man’s sin switching from arrogance to shirk felt like a break in continuity, I can rationalize a moral out of this switch. As for The Discipleship of Moses…it worked fine once we got to the part with Al-Khidr, but the starting sequence with the fish doesn’t make sense. Yet with these stories, I don’t feel the need to count on another section of the Quran picking up these threads or filling in the gaps. All the stories were resolved and communicated their message to me, so I’ll say they were fairly complete.